Real Name: Phil Timper. First Appearance: Spawn # 31. Whats the Story? : The redeemer - God's own eraser. Chosen and transformed into an Anti-Spawn, subcontracted by heaven to redeem or destroy Spawn on Earth. Many have worn the uniform of The Redeemer but few have been able to wear and use the power within it. Throughout time when the curse of the Spawn has found it's way to the landscape of mortals, the power of Heaven has often sought out the help of the agency known as The Star Chamber. Not much information is known about The Star Chamber and it's true connection with Heaven. The services of The Chamber have been called on from time to time to assist in the down fall of the various HellSpawn that have thrown Hell's attempts upon the universe. Having taken many forms through the ages; Redeemers, like HellSpawns carried the same rage of brutality that befall that of Spawn. The only difference is the core of light instead of darkness that is carried from within. Although it has been dimmed in his memory, Jason Wynn was once chosen to be a Redeemer. He tried his hand at defeating the current Spawn, once known as Al Simmons, ironically engaging in battle with the same man he'd fought with on earth. Without the complete purity of heart, he failed. Another soldier was needed. That soldier is Phil Timper. After years in and out of various juvenile detention farms and later as an adult serving a two year rap for grand felony, Timper saw the light through prison bars and gave himself completely to the service of the Lord. For eleven years, he walked the path God set before him turning others' darkness into light with unselfish devotion to the righteous way all the while praying that he would always be worthy of God's kingdom when the time came. It was this very core of goodness that caused The Star Chamber to 'enlist' Timper into the duties of The Redeemer. His human body was transmuted with nuclear diffusion so that he could harness and use the power. The Star chamber was alerted to the location of Spawn through the three aura readings they were receiving from the area in New York City known as The Bowery. Two of the readings were weak. One being the Bum, Bobby and the second one was from Cogliostro. The main and most powerful reading came from Spawn himself. The Redeemer sought to kill Bobby first thinking him to be another servant of Hell. Upon personal confrontation with Bobby, The Redeemer found that his signal came from a necroplasm transferal from Spawn. This was noted as a first and The Redeemer felt that this situation would be dissected and learned from. After a brief set back, Spawn was able to accept the change in his living costume and was able to save Bobby and stop the Redeemer. This proved to be a new turning point in the rebirth of Spawn's costume and with Spawn himself. 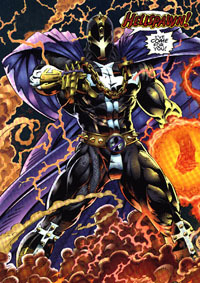 In the final battle, The Redeemer's left fighting hand was loped off by Spawn's costume. In the massive fire fight that ensued, Spawn used his powers to transport he and Bobby back to Rat City, the ugliest part of New York's alley ways. For the time being, The Redeemer awaits his next mission. He will use the knowledge from his battle with Spawn as a valuable weapon for their next meeting.